Tensions were always anticipated at the APEC in Port Moresby. Commuting from Cairns in Airforce 2, Mike Pence sought to high-jack the long tradition of consensus-building at APEC Summits embracing countries from a diversity of developmental and strategic perspectives. PNG’s Prime Minister Peter O’Neil was not bowled over by the megaphone diplomacy from the Trump Administration. “All the outcomes of the APEC Leaders resolutions have been endorsed by the leaders but because of tradition China and United States are arguing about Trade barriers, and that part of the agreement was excluded and agreed to continue discussions by the officials,” Mr O’Neill said. Senior business leaders from around the Asia-Pacific, meeting in Port Moresby this week ahead of the annual APEC Leaders’ Summit, expressed deep concern about the risks to continued regional prosperity from current trade tensions between APEC economies. In their annual report to APEC Leaders, members of the APEC Business Advisory Council (ABAC) called on Leaders to continue support for the integrity of the multilateral trading system, to commit to actions that lead to the eventual realization of the Free Trade Area of the Asia-Pacific and undertake greater engagement with civil society and business to explain the benefits of trade liberalization. ABAC asks governments to adopt complementary policies to ensure the benefits of trade are more widely shared across economies, through real income growth for lower- and middle-income groups. Pressed by a persistent journalist at a door-stop interview on the HMAS Adelaide in Port Moresby Harbour, Prime Minister Morrison admitted that Australia wanted to be an ongoing strategic friend to both China and the US. Showing appreciation for Prime Minister O’Neil’s capacity to contain the tensions at APEC showed Prime Minister Morrison could offer a balanced perspective when he not playing the role of a Cold War Warrior. I congratulate Papua New Guinea for its excellent hosting of APEC 2018. Over the course of a year of events, Papua New Guinea did an outstanding job under Prime Minister O’Neill’s leadership and stewardship. Like other APEC delegations, Australia enjoyed PNG’s very warm hospitality and hosting arrangements, done in true PNG style. And Prime Minister O’Neill deftly chaired Leaders’ Week events. This was no easy task given the range of differing views in the room. It’s important to remember the outstanding achievements of APEC economies. The economic growth, trade growth and improvements in the ease of doing business in the region have been nothing short of remarkable. Australia remains a strong supporter of free trade, and the principles underpinning the global trading system. We are also a leading supporter of APEC, and a close friend of PNG and other APEC members. China has also been gracious about acceptance of Chinese Taipei as a member of APEC twenty years ago. Likewise, the US Clinton Administration took a tolerant line in accepting the membership of Russia and Vietnam in 1998. US Vice-President Mike Pence was probably just testing the waters at APEC as a prelude to the direct encounter between Donald Trump and President Xi at the G-20 event in Buenos Aires (BA) on 20 November 2018 to 1 December 2018. The likely outcome in BA is a cooling of tensions between the US and China as well as a willingness to compromise on the need for Chinese strategic hegemony in the South China Sea. While Vice President Pence scurried back to the White House for a lunch with President Trump, President Xi continued his rapport with regional leaders with official visits to Brunei and the Philippines. Further South, Vanuatu, Tonga and Samoa agreed to join China’s Belt and Road Project. Ironically the strategic advice came from the US as a non-member state of ASEAN. 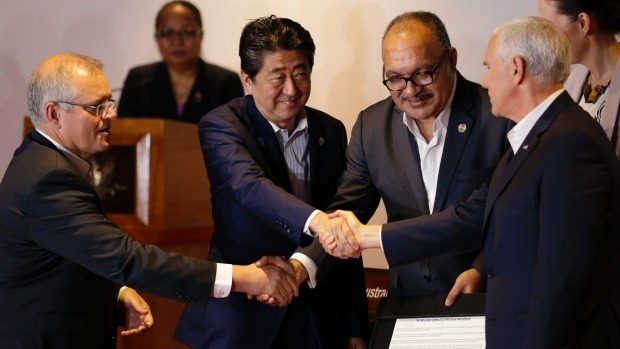 Prime Minister Peter O’Neil relished in the cash bonanzas from US Alliance to assist with electricity infrastructure and the construction boom from the proposed Manus Base Island Base. PNG should of course be free to welcome the navies from the seven seas and benefit from associated tourism and community development on Manus Island from its blighted image as an Offshore Detention Centre. The PNG economy definitely needs some stimulus as the mineral and gas exploration boom flattens out. For PNG, APEC has been the success of the new century. Don’t worry about all this strategic bluster at APEC. It might not extend beyond the G-20 Forum in BA between 30 November and 1 December 2018 as the Trump Administration oscillates between the extremes of aggressive and conciliatory responses. Economic data from PNG parallels the extremes of these diplomatic mood swings from the White House. Denis Bright is a registered teacher and a member of the Media, Entertainment and Arts Alliance (MEAA). Denis has recent postgraduate qualifications in journalism, public policy and international relations. He is interested in advancing pragmatic public policies that are compatible with contemporary globalisation. The situation was fraught in Port Moresby. The Chinese kicked local media out….telling them to “get out” when the PNG Prime Minister had invited them to report on the proceedings. Chinese media were allowed to stay. Arrogant rude behaviour in the extreme. China does not adhere to the rules regulating Trade set down by the WTO nor do they recognise International Law unless it suits them. There are other worries regarding intellectual property and the stealing of information. The Chinese need to be pulled into line but Trump slapping Tariffs on Chinese goods and starting a Trade War is hardly the way to go about it. The so called debt trap, especially for poor countries in Africa where China has invested billions is a serious headache.China is becoming more and more sure of itself and all too willing to throw its weight around. There is a obvious display of diplomatic amateurism by some coalitions who have for many years given only lip-service to our Pacific Island neighbours, or worse..and known by them..a treatment of respect equal to the Southern American disparagement of : “Boy!”…and used their people, land and good nature as a throw-away item…until now…when another player is in the position to ; “make an offer they can’t refuse”..
How do you know what is in the Chinese archives? I think what you will find is War with all its neighbours and the extraction of tribute including who can rule in neighbouring countries. I might point out that China has no allies apart from North Korea. No friends. And so old. Why is that? They fell out badly with Russia and there is a border dispute between them brewing which will happen one day. I think you will find that APEC has done some good work in the Pacific region and by 2020 they will have finished the original plan of opening borders and doing away with tariffs. As it is trade has soared in the region. And its’ time to move onto the next project which is electricity. ” How do you know what is in the Chinese archives?”….I use a philosophical construct of my own design called “Logical Truth”…it uses the principle that where there is a vacuum of written proof of a subject, you look to the physical existence of what has been done..and the physical existence of archeological remains that date back thousands of years demonstrate a sophisticated set of rules and rituals over many dynasties..thereby suggesting…nay…proving trade and communication with the outside world. And I might remind you, Karen, that not all diplomacy ends in both sides coming out equally…Take the case of the Ostrogoths under Alaric poised to attack Rome…The Roman ambassadors suing for a peaceful settlement were given conditions very deleterious to the City..
PNG is surely one of our most important neighbours , being so close to our northern tip. Great front- line research Denis . You don’t know what is in the Chinesr archives. You are engaging in fantasy and making stuff up while trying to clothe it as an intellectual enveavour. Read some decent Chinese history and never mind about philosophy of your own design. Try and stick with the facts. Can we trust the federal LNP to deliver electricity infrastructure to the 87 per cent of the PNG population without access to electricity? Chris…..apparently that is the plan and it isn’t just as Australian initiative, And it is likely to be taken over by a Labor Government I hope. Did I say I knew what was in the Chinese archives?..huh!..did I…that’s YOU making things up…anyway..I’m not discussing anything with you here..I have just criticised you over on my own post, go there and we can have a damn good scrap! Denis, thanks for your balanced coverage of the APEC summit in PNG. Australia has neglected it’s neighbour for too long. How are GDP growth rates so high, with most of the country living below the poverty line? Good that Australia is contributing to further the nation’s infrastructure and should be doing more. Interesting & timely article Denis. Australia needs to be aware of our place in the Pacific, maintain our own sovereignty and economic interests independent of the United States. By the way I think PNG would be right to feel insulted that Mike Pence felt he could not sleep on PNG soil . John W……According to Paul Keating Australia has lost a lot of it’s influence simply because we have used it up by Gough Whitlam first recognising China before the US did it and then eventually Keating getting all the leaders of the Pacific region together and forming APEC. Now that has been done Australia is no longer needed in that role. It is finished. The leaders can meet and talk to each other without us. That kind of influence is never permanent. As for the refugee problem that is dictated by the electorate. Poll after poll and survey after survey demonstrates that Australians by and large are against unregulated foreign arrivals by boat. The political parties have fallen into line with electorate opinion. This is not to suggest that conditions are satisfactory, they ought to be a lot better but you have to come to terms with the fact that this is how most Australians are. The damage of the industrial development has taken place on a worldwide scale with Industry moving off shore where labour is cheaper from every developed industrial nation. Australia isn’t unique. China benefited but as wages in China rise industry will leave China for the next cheap peasant labour force. This is not the kind of world most of us are happy about. But we are stuck with it until the next :big thing” comes along.